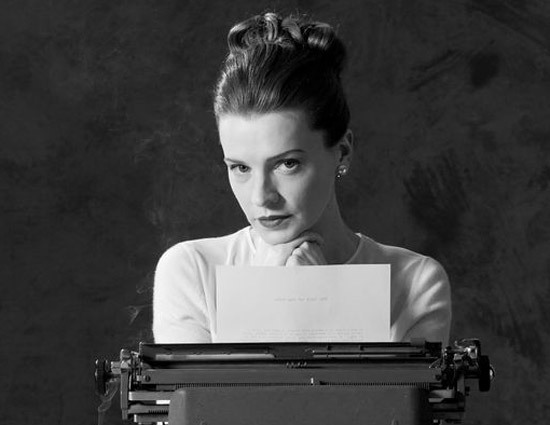 While “I was born to be a New Yorker” is the tagline for the play, the real subject of the play is Brennan’s struggle with being a writer and the highs and lows of her writing life. The daughter of an Irish rebel and diplomat who had left behind her family and her homeland to pursue a writing career in New York, at the age of only 32 she landed the role of staff writer for the New Yorker magazine, initially writing the eponymous social diary she kept under the pseudonym of The Long Winded Lady. Along the way she developed her voice as a short story writer at the encouragement of Wallace Shawn, but the writing never came easily to her and creative frustration, mental illness and the chaos of her existence all took its toll. The Talk of the Town centres on this period in Brennan’s career. The play is a beautifully staged piece; a series of multi-purpose tables alternatively depicting the hallowed offices of the New Yorker, Brennan’s writing desk in her series of ever-changing apartments, the whirlwind of bars and restaurants she frequented throughout her life both in rowdy company or in her latter years very much alone, and the downing of many martinis in the Algonquin. Wine glasses clink and typewriters clatter, and the comings and goings set the scene to illustrate the energy and glamour of the heyday of Brennan’s writing career through her tumultuous marriage to fellow journalist St Clair McKelway to the point at which mental illness took hold. 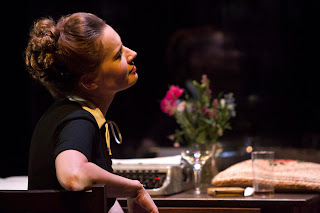 But to the back of the stage, and behind her fragile public presence, is a set of a kitchen that serves to illustrate the tableaus which fed many of Brennan’s stories and indeed her demons, as fragments of memories from her childhood are enacted as scenes through its doors and corridors. 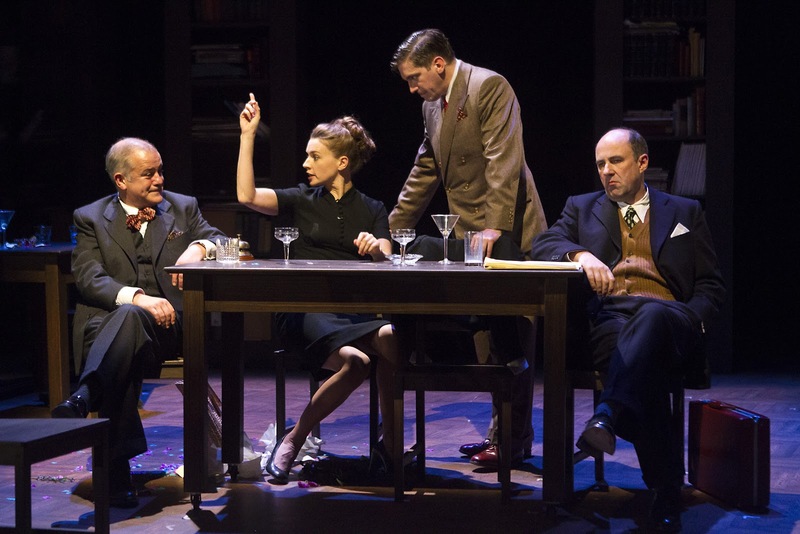 Produced jointly by Hatch Theatre Company, Landmark Productions and Dublin Theatre Festival, and in the hands of Annabelle Comyn’s assured direction, it feels like a production which really sought to be worthy of Brennan’s legacy. It manages a balanced portrayal of a writer and a complex woman that is neither hagiography nor soap-opera. Unfortunately many of these feel a little unsatisfying; snatches and glimpses of unease that don’t really serve to tell us much as audience, expect perhaps in mirroring Brennans’ own frustrations with these half-memories and nearly-stories, or echo scenes from her writing. They are scenes of simmering familial tension, and there is a sense of mystery, even threat to these which is unsettling but ultimately they don’t tell us much. Themes of family and isolation play out both in the main narrative and the play within a play, and they culminate in a staging device which crashes down at the point where Brennan’s anguish at writer’s block starts to take hold. For all the onstage movement though, The Talk of the Town is a wordy play about a wordy woman, and Emma Donoghue’s crisp dialogue frequently sparkles. Brennan spars with vigour in the entirely male world she inhabits, and her exchanges with her colleagues are an enjoyable portrayal of time and place, peppered with the quick-witted banter of her intellectual world. The brisk pacing however, interjected with scenes from the flashback/ imagination tableau, can sometimes seem like a series of strung together vignettes and while this propels you forward, it often feels too stop/start to allow your emotions fully connect. Brennan’s story is very moving, but for all that her portrayal rings true, it can be strangely unengaging of audience empathy. Catherine Walker’s Brennan is initially a study of mannerisms, and physically at least the similarity is entirely convincing. She is the young Irish girl in the City, and admits to wonderment at New York despite a weary, knowing cynicism at her own naivety.Her Brennan is poise and style, all undercut with a brittleness and nervous energy which frequently explodes in irreverence and Irish expletives which thoroughly bewitch her male colleagues. The ensuing affairs, partying and drinking into which Brennan throws herself headlong clearly do her no good. But it is in Brennan’s decline that Walker really shines; her perfectly coiffed hair becoming increasingly disheveled, and her physical presence more edgy and restless as her behavior becomes more erratic. The Talk of the Town is a well-crafted piece of theatre, dealing with a fascinating character who lead a fascinating life. While Emma Donoghue seems likely to remain best known for her fiction (her short story collection Astray is published later this month), her writing feels at home on stage here. Perhaps one of the play’s real achievements though may be to shine a light on one of Ireland’s often-overlooked writers, and bring a new regard and readership to the work of Maeve Brennan.